This manuscript belongs to a set of extravagantly illuminated Books of Hours that were created when the first abundantly illustrated printed editions arose in Paris from 1485 onwards. These books were produced as a ‘strong statement’ by Parisian illuminators in order to prove that their paintings were superior to the printed editions. Even though they themselves were also active in the print trade, either as illuminators of prints or as designers for wood or metal cuts. 185 x 123 mm. – 63 leaves, more than 70 smaller miniatures in different sizes, mostly positioned in the outer borders, some with very unusual iconography. Ten half-page miniatures combined with a related second scene below 9 text lines. The original book was probably taken apart by a former owner, who may have thought that such a vastly illuminated manuscript would make two decent volumes. This part opens with the Suffrages of Saints, which in Parisian Hours would usually constitute the end of the book. Next, the manuscript shows a continuous and, with two exceptions, uninterrupted text sequence, beginning with the Gospel lectures, prayers to the Virgin, the Office of the Virgin (with two pages missing), the Penitential Psalms, and the Office of the Dead (lacking one or two pages at the end). Thus, the Book of Hours is almost complete with the most important text passages. The margins of the text pages are decorated with arabesques, flowers, fruits, animals, and grotesque creatures interspersed with other elements. In the text and in the margins, more than 70 small miniatures are integrated. Moreover, there are ten large, half-page compositions combined with a related second scene in the bas-de-page. Even though the illumination is outstanding, the artist remains anonymous. In all miniatures, he zoomed in on the protagonists, which are mostly shown as three-quarter figures. The artist loved rich highlights in liquid gold, applied in dense cross-hatchings to define draperies, locks of hair, or foliage. Faces are somewhat elongated, while males often have more pronounced cheekbones and darker complexion than females. Hair and beards are defined as soft and fuzzy, characterized by short wavy streaks. The palette is intense and convertible: bright and gaudy colours are as favoured as tone-in-tone properties. All in all, the plentiful use of liquid gold that coats the composition like a luxurious web and the rich use of camaïeu d’or grants the illumination an overall sumptuous quality. 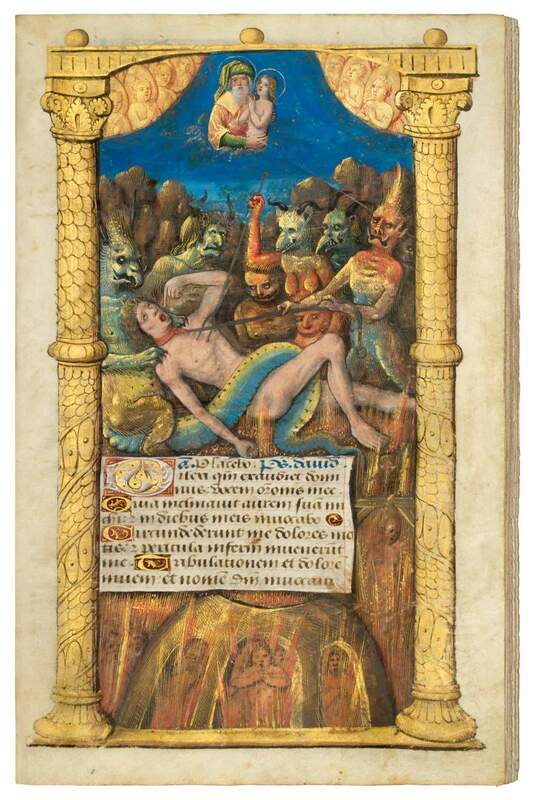 Homogenous in style, the illumination seems to be fashioned by a single master, who combines features that recall the works of the Monypenny Master and the Master of the Chronique Scandaleuse, both are known to have worked in Paris.